To begin, you need an idea. Revolutionary, I know. 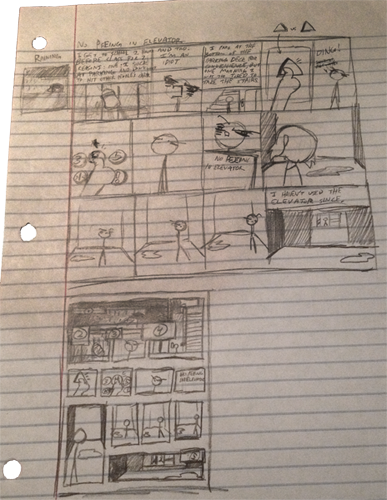 Once I get an idea, I start with thumbnail sketches to get the story down on paper. This hearkens back to my early comic-making days where I would make panels six lines tall on notebook paper from red line to red line. Each row of panels holds four or five panels, the same number of McNuggets to include in a 10-piece box to make me less than cordial. After that, I move on to layouts, which I’ve already described once, but to summarize, I take my thumbnails and, well, make a page layout. Once the layouts are done, I go to the big boy computer paper that cost me a whole $5 and draw the absolute bare minimum I need to get the point across. I’ve gotten where I don’t bother with the layouts at this point since I do most of my backgrounds digitally now, so these pages often swirl and twirl and rumble and tumble when you try to make sense of it. Quite a fancy process so far, right? Then I scan it. 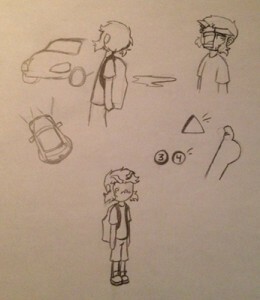 If I don’t have access to my scanner, I cry in the corner. 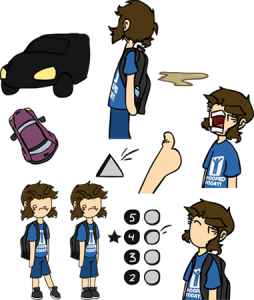 Next up comes the part I hate the most: lineart. In times past, I would ink my stuff by hand and just darken it up in Photoshop, which isn’t all that bad. However, recently, I’ve started vectorizing my lineart to get a different look. It isn’t all that bad of a thing to do so long as you have a tablet. Unfortunately, I don’t. And then I go cry in the corner, trace a little of my scanned sketchwork in Flash (the brush tool is a million times better than Illustrator, and live trace makes me want to hurt people), and then go cry some more. Thirty minutes to a few hours later (depending on how much I have to trace), the lineart is finally finished, and then I go cry some more and apologize to my computer for the things I said to it. Now comes the easiest part: coloring. With a vectorized lineart, I just grab the paint bucket and boop de boop. Color. 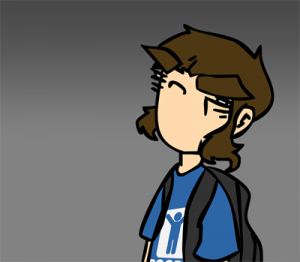 If it’s cel shaded, I’ll throw in some shading here too, but, so far, I haven’t cel shaded a comic. It’d probably add another two or three hours to the process if I did. After all of the things I scanned in are vectorized and colored, I throw them into Photoshop, make a frame following the layout sketch I made way back in step two, and render some backgrounds and/or environments using some kind of magic the likes of which I’m not at liberty to talk about, and, after eight to ten long, tear-filled hours, a single comic page is born. I’m gonna go cry in the corner now. 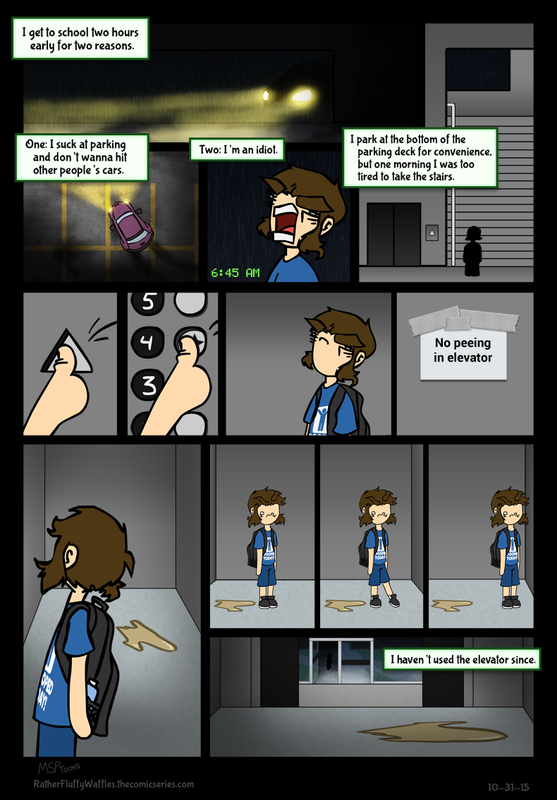 This entry was posted in Webcomics and tagged art, cartoons, comics, fluffywaffles, illustration, process, webcomics by Joseph. Bookmark the permalink. I draw cartoons, eat way too much ramen, and make fun of myself far more than I probably should.